With the summer heat, hotels and resorts everywhere are beginning to fill up for the warmer months. Everyone is ready for a much-needed break, and they usually go to one trusted place to get it: resorts and spas. That’s why it’s vitally important for resorts to offer guests a relaxing, accommodating experience from start to finish. Because as a hotel owner, you know that every detail counts. That means creating an effortless check-in process, a comfortable place to sleep and a relaxing outdoor environment to enjoy throughout their stay. Building a reliable staff and filling your hotel with the best linens and furniture is one thing. But when faced with the unpredictability of the outdoors, and controlling that environment there’s only one place to turn, Koolfog’s resort misting systems. When challenged with keeping guests cool in outdoor seating areas during a season when temperatures have been known to climb into the nineties or hundreds on an average day, the need for a misting system is vital. Whether your guests are enjoying a meal out on your restaurant patio, laying by the pool or taking a stroll around the resort grounds, the need for comfort is still just as important outside as it is indoors. That’s why misting systems play such an important role in guest comfort. These high-pressure systems are designed to cool surrounding areas by up to 30 degrees within minutes of activation. In humid regions, they also help to minimize the perception of humidity by creating a cooler environment that guests feel is comparably more comfortable than the warmer alternative. When properly designed and installed, resort misting systems will keep guests comfortable and ensure that your outdoor areas remain busy all summer long. It will also have them coming back again for summers to come! Having misting systems consistently and strategically placed throughout resort grounds will make hot, sweaty and stressed out guests a thing in the past. Utilizing the available roof, terrace and other spaces outside to install resort misting systems is a great place to start. Specifically, you can install misting systems on the patio of your resort’s restaurant, at the pool area, near walkways, in fountains and around outdoor lounges. 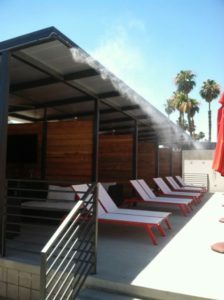 Using misting systems in cabanas is another popular feature that many hotels now offer to guests. Creating these exclusive areas that offer privacy and comfort along with the cooling of an outdoor oasis makes for an even more exquisite resort experience. In areas where misting lines don’t reach, many hotels have installed misting poles, that also effectively help in cooling large pool areas and walkways where there are no structures to attach to. Are you ready to make sure your resort is memorably cool? Contact our misting experts today to start designing the resort misting system that’s right for you.